Show us Your Spokes Ticket Giveaway! The Source is giving away two pairs of tickets to Parrilla Grill's Show us Your Spokes concert series sponsored by Deschutes Brewery and Rise Up International. The tickets are good for any of the upcoming shows including the recently reunited locals Harley Bourbon on Aug. 16 and MoWo (who doesn't love MoWo? We'll say it...if you don't love MoWo you're probably a terrible person) on Aug. 23. 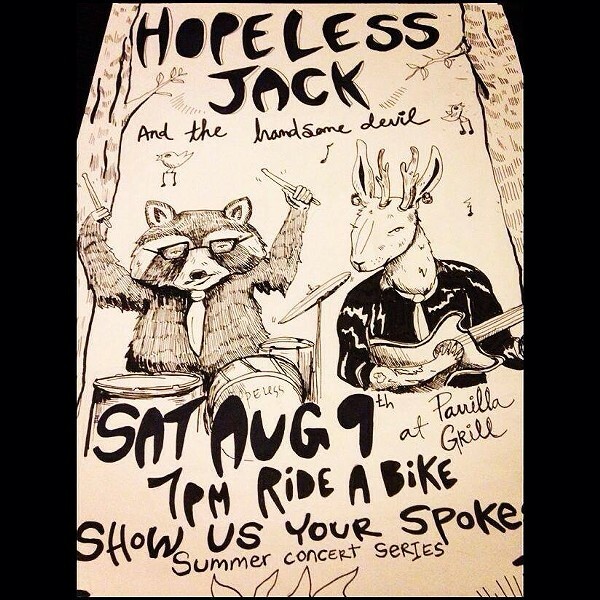 This Saturday's show is Hopeless Jack and the Handsome Devil, wild-eyed blues rock from Portland. To win the tickets, comment below with your favorite song to ride your bike to! We will announce the winners on Thursday afternoon. And remember, if you commute to any of the Show Us Your Spokes concerts without using a motorized vehicle you get a beverage ticket and a raffle ticket upon arrival! Yay for wheels!